Beautiful cabin. It was quite and peaceful; close enough to the excitement but far enough out of town to give you the best of both worlds! The cabin was clean, spacious and the views were really nice. I would recommend it to others and I would stay there again. We had a wonderful time. Made lots of memories and plan on coming back at the same time next year and hopefully will stay in the same cabin. Our stay was okay... The cabin wasn't decorated for Christmas as online said it was.. The upstairs shower head leaked when you tried to adjust it. The dryer took 3 hours to dry a load of clothes. The living room needs more furniture. Other than those few things, the stay was okay. More effort and focus should be put into the cleaning of these cabins. Honey bear was a nice cabin to stay at but was not clean. We were very satisfied with the location and the cabin also. Was a very good location and the views of the mountains were also good. Would recommend this cabin to anyone. We were locked out of cabin for one hour which was a little annoying because the battery needed to be replaced on the lock. The owner came up to check it out so that was nice. The place was very nice and exceeded our expectations. We loved it there , but the hot tub only worked for a short period on the first day. The staff tried to fix it but was unable, we were sad that we couldnt use it. Other than that our stay was fantastic. I would gladly stay there again. This place was awesome. Cabin was great and location was very relaxing. LOVED this cabin. Everything was clean inside and out. We already have plans of coming back and staying here in the fall again. The cabin has a pool table and a juke box. Honey Bear was a great property. Would likely reserve it again! This was the first time I have ever rented a cabin and my experience was wonderful. The staff was friendly and very helpful and answered all my questions. Although it was a little bit of a curvy road to get to the cabin the location was perfect and we went straight to the cabin. A beautiful piece of property and we had everything there we needed(except for our own personal spices to cook with). Much better than a hotel. I’m would definitely stay here again. Easy access to the main strip. Upon arrival the cabin was not clean. Floors was not swept nor mopped. We had to wash dishes before we could use them and the dishwasher was nasty. We had 7 people that stayed for 3 nights and I had to wash towels and wash rags during our stay just to be able to shower everyday. Having a washer and dryer was nice but the dryer would not dry so what should have been a quick process of washing and drying a load of clothes took forever! The cabin was nice and we liked the location but house keeping needs to do their job and the cabin does need maintaining. The cabin. The reservation process. Express check in and out. Everything was perfect! We made lifetime memories with our family. Everything was amazing! It was a nice getaway from everyday life with the people we love most! The cabin was amazing and the view was the best part every morning. We are already planning our next trip! I have stayed with Cabins Usa about 5 times in 2017- this was the most enjoyable stay I have ever had! Such a beautiful, well taken care of cabin, we will definitely be back! My family enjoyed staying at Honey Bear. The pool table was used every day. Great view of the mountains. One suggestion would be to add an outside fire pit. The cabin was very nice and beautiful! However, it hadn't been cleaned very good and we had to wash all the dishes before we could use them. Also, we stayed in this cabin in December and it was supposed to be decorated for Christmas and it was not. We loved our stay- a few things that would have helped- more towels, and trash pick up- we had a lot of trash for the week and would have been nice if we could have dropped it somewhere or could have had it picked up!! Other than that it was great!! The upstairs toilet was running when we had gotten there and the plumbing under ther kitchen sink was leaking- we didn't notice until we had opened the cabinet later in the week and someone had placed a bowl under it- other than that very nice! This was a very nice looking cabin, a few things need attention though. 1. There is a spotlight for the hot tub but none of the switches in and around the house turned it on (maybe the bulbs were out) we ended up just using our cell phone lights to see. 2. The floors looked ok, you couldnt see any dirt, but we have a crawler and after a few minutes of crawling around her clothes were black!!! (Not sure if they mop unless it looks like it needs it) 3. The couch needs replaced, it sinks way in when sitting on it, there are rips in the material. It was very uncomfortable. As far as the good things, we loved the Juke box, it was nice to have music while enjoying the place. The hot tub was very nice, just wish it was closer to a door to get inside. Liked the layout of the place, the stairs were a little scary for having little ones but I dont think you can even get a cabin without stairs. The stairwell was too wide to use our baby gate. The clothes dryer quit working while we were washing our sheets. It was too late for the office to bring us some extra sheets and the maintenance person couldn't fix the dryer. We had to dry our sheets by hanging them by the fireplace. Cabin was extremely clean and comfortable. There were Problems with hot tub so we couldn't use it as much as we would have liked to and upstairs deck would have been better if there were chairs to sit on and sip our coffee before we joined the family downstairs. It would have been fun if the juke box worked. Over all, we had a great time and would recommend USA cabins and Honey Bear. Thank you for taking the time to let us know about your recent stay in Honey Bear! We here at Cabins USA work hard to make sure each of our guests have the best stay possible while vacationing in the Smokies. Thank you for letting us know about hot tub and jute box. Maintenance has been notified and will be addressing those issues. When you are ready to stay with you again, please mention you are a return guest for an additional discount. Thank you again for your review and thank you for choosing Cabins USA! The booking process was very quick, as well as check out. The cabin was beautiful and only about 10-15 min. from Pigeon Forge. The only problem we encountered was the pool table was lacking the cue ball and the jukebox would not work. We spent most of our day in town but these would have been nice to have at night, especially since we have children. The office and maintenance was notified , but no return call was received from maintenance. Overall, this is a very nice cabin to stay in! Thank you for taking the time to let us know about your recent stay in Honey Bear. We here at Cabins USA work hard to make sure each of our guests have the best stay possible while vacationing in the Smokies. I apologize that no one came out to resolve the issues you experienced with the pool table and jukebox. Your comments have been forwarded to our maintenance supervisor to ensure they do not happen in the future. When you are ready to stay with us again, please mention you are a return guest for an additional discount. Thank you again for your review and thank you for choosing Cabins USA! My family had such an amazing time. 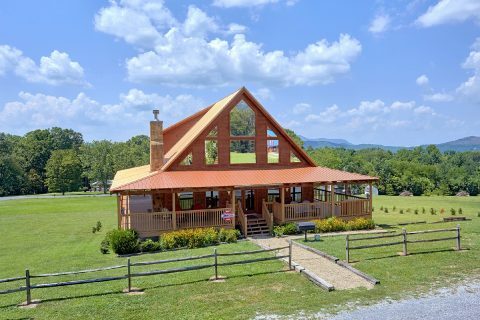 This cabin is only minutes from Pigeon Forge, but far enough so you don't hear all the noise. My family will be renting from Cabins USA in the future. The staff was nice and curtious during check in. Thank you for all of your kind words! We here at Cabins USA work hard to make sure each of our guests have the same great stay you enjoyed while vacationing in the Smokies. When you are ready to stay with us again, please mention you are a return guest for an additional discount. Thank you for choosing Cabins USA and we look forward to having you as our guest again! This was a wonderful place to stay, but the location isn't the best . The scenery around is gorgeous however it is a little far from the main events, shops,etc. Thank you for taking the time to let us know about your recent stay in Honey Bear. We here at Cabins USA work hard to make sure each of our guests have the same wonderful stay you enjoyed while vacationing in the Smokies. When you are ready to stay with us again, please mention you are a return guest for an additional discount. Our reservationists will be more than happy to help you find a cabin that is located closer to the area attractions. Thank you for choosing Cabins USA and we look forward to having you as our guest again! Awesome place!!!! This is our second stay through Cabins USA! I plan to continue doing business with you! Thank you for all of your kind words! We here at Cabins USA work hard to make sure each of our guests have the same great stay you enjoyed while vacationing in the Smokies. Thank you for choosing Cabins USA again and we look forward to seeing you again soon! We had a great time at Honey Bear. The booking process was very simple and check in was a breeze. Literally took 3 minutes in the office. Cabin was very clean and everything was in good working order. I would say it is a little too far for families wanting to spend a lot of time in Pigeon Forge but we made due. Check out was a simple text message. We will definitely be using Cabins USA and very likely to stay at Honey Bear again. I am so happy to hear that you enjoyed your stay in Honey Bear! We here at Cabins USA work hard to make sure that each of our guests have the same great stay you enjoyed while vacationing in the Smokies. When you are ready to stay with us again, please mention you are a return guest for an additional discount. Thank you again for your review and thank you for choosing Cabins USA! This was our first time using CabinsUSA. We will be using them for ALL our future vacations to the Smoky Mts. I searched for months looking for the perfect cabin. I booked it at a great price. Check in was smooth and the office was so easy to find. Sadly, my car couldn't get up the driveway to the cabin because of snow. We were so disappointed. We went back to the office, hoping they could help us. The two young ladies that helped us, Brittany McKee and Courtney Anderson, went above and beyond what I had expected. They put us in another cabin that we could get to. The cabin Honey Bear was exactly what we needed. It had everything we needed or wanted. It was perfect. The family loved that everything we wanted was on the main floor. The location was great. Loved the views. Nice quiet neighborhood. Even though it snowed us in for three days, it was awesome. We live in Florida and we come to the mountains for the snow. My favorite thing that I loved was the juke box sound system on the wall. Loved the music. The downstairs bedrooms were perfect, and the master bedroom was wonderful with a private balcony. Really loved that the porch wrapped all the way around the cabin. It was perfect. Truly had a great time. Thank you so much CABINSUSA for a perfect time in the mountains. Thank you so much for all of your kind words! Our staff truly appreciates when they are recognized for providing our guests with the best experience possible when visiting the Smokies. Thank you again for your review and thank you for choosing Cabins USA! Honey Bear is an absolutely lovely cabin, very, very quiet area. My only complaint is the cook ware. Although, I am sure they are an expensive set, they are not good for actually cooking with. Absolutely everything sticks to them, but we made do, had to throw our breakfast gravy out, but we survived. LOL! I would highly recommend taking your own, if you plan to do any real down home southern cooking. Otherwise, everything else was ABSOLUTELY WONDERFUL, and even though it rained the entire time we were there, we didn't mind with the covered wrap around porch. I am so happy to hear that you enjoyed your stay in Honey Bear! We here at Cabins USA work hard to make sure that each of our guests have the same great stay you enjoyed while vacationing in the Smokies. Thank you for letting us know about the pots and pans in the cabin. Your comments have been forwarded to our Owner Liaisons and will be speaking with the owner of the cabin. Thank you again for your review and thank you for choosing Cabins USA! We had to go to the office to print some tickets on Mon and the staff was told that the TV in the upstairs bedroom didn't work (this was a little inconvenient), the 2 trash cans were already full when we arrived and stunk, (therefore we left ours in the cabin so the animals wouldn't get in it), the shower curtain in the bedroom off the kitchen had mold on it. The staff didn't seem concerned or acted as if they cared. Also, but not mentioned to the staff, the hot water was ridiculous. Our children and grandchildren were with us on the weekend (we hauled all our presents for 7 hours to celebrate Christmas there) more than one of us had cold showers or had to wait for the water to get hot again. The cabin sleeps 8 it should provide for 8. And my final issue was before we arrived i checked to see if the cabin was decorated for Christmas, since we were opening presents and this trip was a total surprise for our 3 and 10 yr old grandchildren, DECORATED FOR CHRISTMAS does not mean 3 tiny little trees. DISAPPOINTED. Would we return to this company and this cabin. Probably YES, we would give it one more shot. Cabin was way out but loved that we weren't in a resort on top of others. Not necessarily complaints, just ways to improve for future guests. Thank you to the cabin owners for allowing us to stay in your rental. Overall our stay was enjoyable. The location of this cabin was more toward Townsend than Pigeon Forge, which was not convenient. Additionally, the cabin is located in a development of multiple cabins which is very different from the lone cabin in the picture. During our stay the hot tub did not heat. The staff was very friendly when we called to report the problem and they were making every attempt to remedy the problem. We would stay in this cabin again. Thank you for taking the time to let us know about your recent stay in Honey Bear. We here at Cabins USA work hard to make sure that each of our guests have the same great stay you enjoyed while vacationing in the Smokies. When you are ready to stay with us again, please mention you are a return guest for an additional discount. Thank you again for your review and thank you for choosing Cabins USA! Loved the cabin and we had a great time. However, we had a hard time finding the cabin. Did not see the signs to turn off. I prefer to be closer to town, but I'm just glad we were able to find a place to stay. Much thanks to Terri for making it happen. I am so happy to hear that you enjoyed staying in Honey Bear! We here at Cabins USA work hard to make sure that each of our guests have the same great stay you enjoyed while vacationing in the Smokies. I apologize for the issues you had getting to your cabin. We will definitely have those directions updated as needed. Thank you again for your review and thank you for choosing Cabins USA! Very nice cabin. Great location in Wears Valley--we loved the view & will definitely want to stay in the same area next time. Also like the express check-in allowing us to go straight to the cabin. We enjoy dealing with your staff. Thank you for all of your kind words! Our staff works hard to make sure that each of our guests receives prompt and courteous attention to any questions they may have. Not only do we offer express check-in, but we now also offer text to check-out for our guests convenience. Thank you again for your review and we look forward to seeing you again soon! I am so happy to hear that you enjoyed your stay in Honey Bear! Please feel free to contact one of our reservationists when you're ready to begin planning your next trip to the Smokies. They are always more than happy to help each of our guests find the perfect cabin. Thank you for choosing Cabins USA and we look forward to having you as our guest again! We loved Honey Bear. Was perfect for our family. Plenty of room to spread out and relax. Cabins USA is always great to work with. staff is very nice. We had a great time at this cabin. The amenities were nice and we loved the large yard around the cabin and the fact that it wasn't on the side of a mountain. Our little boy loved riding his car around the wrap around deck. The pool table was a nice addition. We had an issue with the fireplace and the dryer and the repair man came quickly to fix both. The mattresses on the beds weren't that comfortable. That is the only complaint that I had. Thank you for your review. We are delighted that you enjoyed your stay with us. We apologize for any inconvenience you may have experienced. We do our best to keep all of our propane tanks full ;however, in the winter when we have a high volume of guests in our cabins and the propane tank becomes empty we have to call and schedule for the propane tank to be filled. In this instance, the propane company was delayed several times due to the weather conditions. Again, I apologize for the inconvenience, and I hope that we will hear from you again soon. We have stayed with Cabins USA for 4 to 5 years now. We usually visit once a year. We have always loved the cabins we have stayed in. They are always so nice and makes you feel like you're at home. I would recommend them to anyone. Music player didn't work, no room to play pool, electric went out due to storm one night tried to light gas logs for heat and light and gas tank was empty with it posted logs could be used after Oct 1st. When checking out they said they was sorry but couldn't do anything about it. We thought the bill should have been adjusted to not having what was advertised to us. Thank you for your review. We apologize for the inconvenience you experienced during your stay with us. We do always prompt our guest at check-in to call our office with any questions, concerns, or needs at the cabin. We would have been happy to have the tank filled during your stay if possible. We will insure this is addressed immediately. We hope that we will hear from you again in the future. This was a beautiful cabin and was exceptionally clean. The area was a little farther out from Piegon Forge than we usually staty, but, this was definitely a well kept cabin in a quite farming community. The kitchen was well stocked with cookware, dishes and utensils. The only thing I would add to the kitchen is smaller bowls for cereal, otherwise was great. Beds were very comfortable. Our family enjoyed the large screen TV and the built in audio sound system. I would definitely stay in this cabin agian. Nice vacation getaway. We had a great time at Honey Bear! The cabin was wonderful, very spacious. Everyone enjoyed the pool table and hot tub. I loved the wrap around big porch with the swing. It is a little ways out from the very busy area of Pigion Forge. We would definitely stay here again! Our stay at the honey bear was a great stay, it was peaceful and quiet. The cabin was awesome and I would recommend Cabin USA to everyone. We really enjoyed our stay at Honey Bear! Our party consisted of 4 adults and a toddler. I couldn't believe the great price for such a nice, clean and conveniently located cabin. We have stayed at several other cabins with other companies and the prices were much higher and the cabins were hanging on the sides of cliffs (some may like that but we don't). We loved that it was on flat land with a yard for the kids to walk around. It also has a complete wrap around porch thats nice. This cabin is located in Wears Valley so it took only about 10-15 min to get to Pigeon Forge. Honey Bear is clean and has updated decor! We plan on staying again soon! Booked this one online when there were no pictures and went on the reviews left. Very glad I did, such a beautiful cabin. Lots of room outside in the yard for kids to play and the hot tub was very relaxing after a day of walking. We liked that the pool table was in the main living area so that everyone could still be together while playing it...and it got a lot of use by my husband and sons. The night we arrived, our GPS said we'd get there just before 10pm to check in. Then we ran into traffic twice that delayed us. I walked in at 10:08 and bless the girls still there. They were kind enough to take 5 minutes and check us in so we wouldn't have to come back the next day to do it. Will definitely look into this one again when we are back down there or book through Cabins USA...very easy process and reasonable rates!! Loved our stay at "Honey Bear" Girls weekend and so enjoyed ourselves. Loved finding the Keurig coffee maker and such a beautiful cabin set away from the hubbub of Pigeon Forge and Gatlinburg. Look forward to our next stay with Cabins USA. Honey Bear was absolutely enjoyable. The family had a great time. We enjoyed the 3D TV, beautiful woodwork in the cabin. A little further from the main strip than I expected. But I will highly recommend to anyone! Had to kill alot of wasp inside the cabin, other than that an wonderful stay! Thank you for your review Traci. We are delighted you enjoyed you stay with us at Honey Bear. I have contacted Orkin and scheduled for them to go out to the cabin. We appreciate your feedback, and look forward to seeing you again soon. Honey Bear was perfect for our family. It had some area for my boys , ages 10 and 11 to play outside. The view was amazing! Everyone at Cabins USA was excellent. We did have a small issue with the hot tub, but they fixed very fast and they were so friendly. We have definitely found a future vacation spot! Honey Bear was clean and family friendly. We were very pleased with our stay and Cabins USA made everything so easy for us just to have a great time with no worries. When we visit in the future, we will definitely stay with Cabins USA!! !